November marks National Native American Heritage Month, and I pledge to write a blog a day. Heritage Month was inaugurated in 1990 by President George H. W. Bush, the same year he signed NAGPRA. While National Native American Heritage Month was designed to honor American Indians by sponsoring special events in schools and cities, NAGPRA legislation was intended to protect Indian remains and belongings. The legislation—the Native American Graves and Repatriation Act—was a long time coming. For centuries Indian graves have been looted and human remains sold as novelties, or stored in museums. Examples abound of relic collectors, some charlatans, some scientists. For example, the surgeon general during Abraham Lincoln’s presidency issued an invitation to Civil War soldiers to collect Indian skulls. More than 800 skeletons were amassed and shipped to Washington DC in the 1860s, according to writer Steve Coll. Thousands of human bones have been collected including a sizable cache of Native skulls and skeletons. Turns out the surgeon general, William Alexander Hammond, spent time in New Mexico before his appointment as head physician, engaged in battles against indigenous tribes. Some notable Indians, including Jim Thorpe, Pocahontas and Geronimo, were never buried in their homelands. 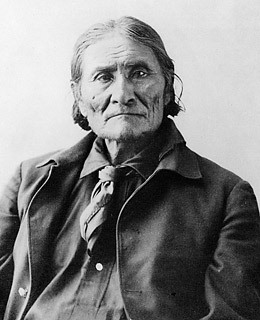 Geronimo’s remains, for example, are part of Yale lore because members of the Skull and Bones secret society are alleged to have dug up the warrior’s bones in Oklahoma when the college men were stationed there during World War I.
Geronimo’s relatives have tried in vain to reclaim the bones, supposedly buried in New Haven, according to Time magazine. How ironic that the president who endorsed legislation to protect Indian remains has a relative whose role in the grave-robbing of Geronimo casts a shadow over NAGPRA. Time magazine reported that President George W. Bush’s father, Prescott Bush, was allegedly a member of the thieving gang that stole the bones and secured them in a secret location. This entry was posted in american indian, Geronimo, Indian, Indian relocation, Indian remains, manifest destiny, native american, native press, Native Science, Redskins, repatriation, rhetoric, writing and tagged American Indian, native american heritage month. Bookmark the permalink.